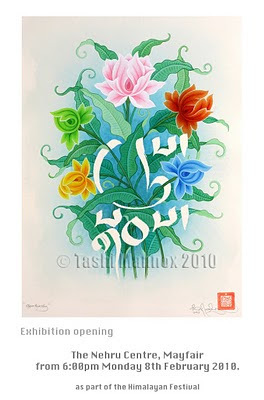 Here's a chance to see in the flesh a few of Tashi's Illuminated iconographic calligraphy pieces, Shown as part of London's first Himalayan festival. Meet Tashi in person at the opening from 8pm Monday 8th February 2010 at the Nehru Centre, Mayfair. Himalaya Exhibition combines art and photography to give an introduction to the cultural forces and trends flowing through the present-day Himalayan Region. It remains open from Monday 8th February until the end of the festival. Entry is free. The landscape and peoples of the Himalaya show an infinite variety, but a young Singaporean photographer, Sam Kang Li, has gone further than most to document them all, having carried his camera through Nepal, India, Pakistan, Afghanistan, and even China. His striking photographs are rooted in humanity and tell us many stories of the Himalaya’s people. Cultural traditions from North and South of the mountains meet here, and this is evident in the work of the three young Himalayan artists who are showing their work at the Exhibition. Tashi Norbu hails from Bhutan, and Govinda Sah “Azad” and “Tene” Garbuja from Nepal. All have trained both at home and in Europe, and the work of each reflects a rich and diverse range of influences, from their native countries, from India, from Tibet, from the sacred and the secular, and from their life experiences. British artist Tashi Mannox is also contributing work to the Exhibition. Trained in Tibetan calligraphy, his beautiful paintings combine classical iconography and script with modern sensibility. There is a form of traditional Tibetan scroll Thang-ka ཐང་ཀ་ painting, which is applied to a black background, normally for the depiction of the more wrathful deities. A similar technique was also used in creating more elaborate Tibetan manuscripts, as out-lined in a previous blog. 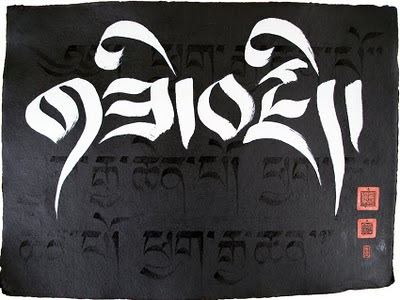 The effect of illuminated imagery from a black base; has given Tashi's creative work a new dimension in the world of Tibetan calligraphy. The creation for Tashi's black on Black series that features in his calligraphy website:Tashimannox.com is a technical affair of old and modern applications. Technically, the first stage of a 'black' calligraphy is to paint a rubber masking fluid on the paper. Black ink is then applied, the rubber resisting the water based ink. Once the ink is totally dry, the rubber mask can be carefully peeled away to reveal the clean white of the paper. Any bright colours can then be painted in the white areas to give an illuminated jewel like brilliance. Other calligraphy is sometimes added with more black ink, giving the signature 'Black on Black' effect. The below image shows additional lettering in gold leaf, this is achieved by first painting a gold size directly onto the black background, then carefully applying Gold leaf. 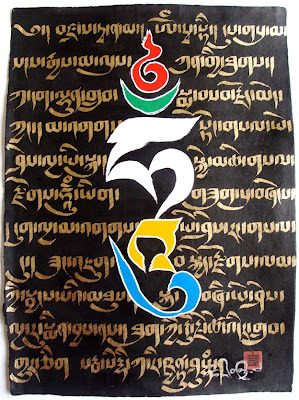 "Five colored Hum" 57x76 cm, Dutch gold and acrylic paint on a black Chinese background, Nepalese rag paper, as part of the Black on black Tibetan calligraphy series, Tashi Mannox 2009. for a more detailed explanation on the meaning of this piece, including the translation, please visit here.